25 Competition: Your chance to win a Cyrus 6 DAC worth �899 in this month's competition. 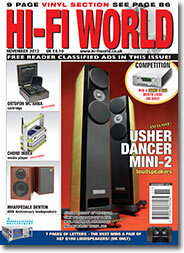 55 World Standards: Brand new, updated guide to the latest and greatest hi-fi hardware on sale. 107 Classic Cuts: Paul Rigby listens to Sema "Time Will Say Nothing" 1982-1984.